I love living a frugal lifestyle. It affords me many opportunities that I never thought I’d have. My husband, on the other hand, had never really been thrifty and needed a little convincing to get on board with frugality. While we were dating, he was definitely more of a spender. I had to pitch frugality to him and slowly reel him in. It’s so important to be on the same page financially with your partner. It can help you avoid lots of arguments and miscommunication in the future. Frugality can also allow you to reach your financial goals quicker. It didn’t take long to get my husband on board with frugality before we got married. But, I did follow a few specific steps. Be sure to keep these tactics in mind if you are trying to convince your partner to adopt a frugal lifestyle with you. Perspective is really everything. You need to understand where your partner is coming from so you can work as a team. Your partner could be focused more on the present while you’re more focused on the future. He or she probably had a different upbringing from you and therefore, has a different relationship with money. For example, as I was growing up money was always scarce which is why I believe frugality was easier for me to accept because it seemed like the perfect solution to help me stretch my budget and manage my finances better. Try to understand your partner’s mindset and current relationship with money as you try to tell them about adopting a frugal lifestyle. If your partner sees you accepting and supporting their perspective, they may be more willing to accept and support yours by giving frugality a try. Highlighting the benefits of frugality to my husband was easy. It was one of the best ways to get him on board. It’s important to debunk any myths surrounding frugality and show your partner how it can help improve your life and finances. Explain how frugality is a choice and a lifestyle that promotes living well on less. It doesn’t mean you have to deprive yourself and you should actually do the exact opposite. Get your partner excited about the idea of saving more money by becoming frugal and being able to spend more mindfully. When it comes to your goals, try to visualize what you want your future to look like. Talk about how frugality can play a major role in getting you those end results. When you go through all the benefits of becoming frugal, it will sound like more of a personal choice rather than a must or a dreaded decision. It’s important to talk about the benefits and any drawbacks of becoming frugal. This way your partner can carefully weigh the pros and cons. First, you should sit down and have a discussion about some of the things you don’t enjoy about frugality (if anything). You might also share some struggles you might have faced when adapting at the beginning. For me, it was hard to limit expenses like dining out. I was so used to it and thought it was a major value of mine. When I developed more frugal habits however, I realized that I wanted to do other things with my money. This actually led me to crave dining out less and less. I also learned how to cook and improve my baking skills. Now I love trying out new recipes at home. After this discussion, be sure to reveal how you believe the pros outweigh any potential cons. You can also talk about what some of the risks could be if your partner doesn’t get on board with frugality. This isn’t meant to threaten them. Instead, it’s meant to make them think about their goals and how avoiding frugality can take them further away from what they truly want. For example, if my husband and I didn’t ban together and adopt a frugal lifestyle, we would still be deep in debt. But, now we’re almost done paying off our debt thanks to some positive lifestyle changes. You probably don’t want to face situations like remaining in debt, dealing with bankruptcy or foreclosure, or just not being able to pay your bills and being stressed out about money all the time. Finally, you might want to consider compromising with your partner so everyone will be satisfied. There are many different levels to frugality. If you or your partner aren’t comfortable with extreme frugality, for example, that’s perfectly fine and you can definitely find a happy medium. The key is to set joint goals together to make sure you’re at least on the same page in terms of what you both want to do with your money. After that, create a budget that both honors some frugal habits but also allows you both to spend a little extra too. Something we like to do if give each other a small monthly spending allowance. This includes a fixed amount each person is free to spend each month on whatever they want. No questions asked. When it comes to becoming more frugal, settle on a level of frugality that you both are comfortable with. Focus on making small changes at first. This could be things like taking advantage of sales, and shopping around for a better deal before making a purchase. You could also try spending more mindfully to avoid impulse purchases, and finding frugal ways to entertain yourselves. You might compromise by reducing the number of times you dine out per week from 3 times to once. If you or your partner wants to go on a pricey outing, be sure to talk about it ahead of time so you can budget for it early on. 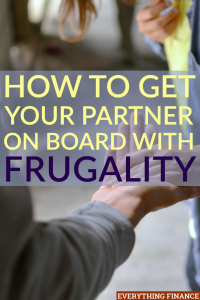 Getting your partner on board with frugality isn’t as hard as it seems. You just have to take the right approach. It’s seriously worth it in the long run! Have you ever had to convince your spouse to get on board with frugality? Who’s the ‘spender’ and who’s the ‘saver’ in your relationship? No Gym Budget? Here’s What You Can Do For Free!